Imagine waiting for that last bit of information to be transmitted. NASA now has all the science data that the New Horizons spacecraft gathered of Pluto and its moons over a year ago. Early in the morning on October 25th, the vehicle sent back the last bit of the more than 50 gigabits of information it collected during its flyby of Pluto in July 2015. It marks a big milestone for the New Horizons mission, as the team prepares for the spacecraft’s next flyby of any icy space rock. It’s taken 15 months for New Horizons to send back all of its Pluto flyby data—a process that was always meant to be slow. The mission team designed New Horizons so that it could store as much information about Pluto as quickly as possible. So in order to fit big enough memory banks on the vehicle, the communications system was a little less robust than previous spacecraft systems. 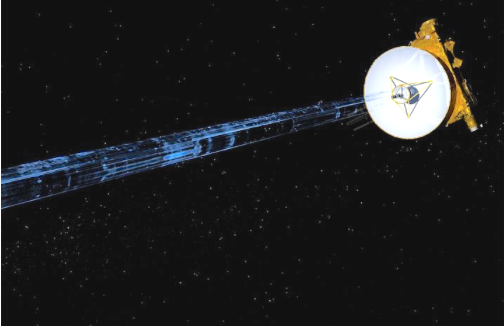 "One of the ways that we economized to make sure that we could fit into this much smaller budget was on the telecommunications system," Alan Stern, principal investigator of the New Horizons mission, told The Verge. "So even though our mission came 30 years after Voyager, they had a much more powerful communication system. But we beat them with much bigger memory banks." On top of that, New Horizons has limited power for its main transmitter — a 2.1-meter high-gain antenna. Plus, the spacecraft is far, more than 3.4 billion miles from Earth at the moment. Just one signal takes more than 5 hours to reach our planet, and it’s pretty weak once it gets here. So given the antenna’s distance, limited size, and power output, its data rate is pretty slow. And since New Horizons took more than 400 science observations at Pluto, the spacecraft had a big backlog of data to send back to Earth. Now that all of the Pluto flyby data has been received, NASA will review all of the New Horizons information and then eventually erase the recorders onboard the spacecraft. That’s because the space agency needs to make room for new information to be stored. New Horizons is currently on its way to another object at the edge of the Solar System — an icy body called 2014 MU69. The vehicle will conduct a flyby of this rock, similar to its flyby of Pluto, and it’s going to need storage space for all the data its instruments will gather. But there’s still some time before that storage is needed. New Horizons won’t reach 2014 MU69 until January 1st, 2019.